Custom Frisbee, Bottle, Visor Kits Personalized in Bulk. Promotional, Inexpensive. Lowest price inthe USA, Canada. 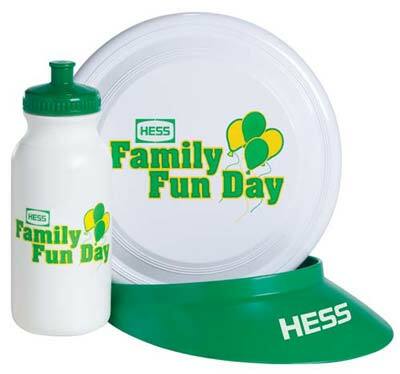 High quality, yet inexpensive promotional Frisbee, Bottle, & Visor Kit in bulk, custom imprinted. We also supply blank (not personalized) bulk Frisbee, Bottle, & Visor Kit for $3.43 each. Free artwork design and Free proofs! American clients pay no taxes. The unit prices below include your 1-color custom imprint on all 3 items. 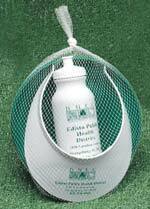 We also supply blank (not custom imprinted) bulk Frisbee, Bottle, & Visor Kit for $3.43 each. Setup Charge: $75.00 for 1 color imprint on all 3 items; $30.00 on re-orders. Production Time: 7 days; Rush Production of 4 days: add $0.95 per kit. Blank (not custom imprinted) kits ship next day. Our fun kit includes imprinted 9" Flyer, Plastic Sun Visor and Bike Bottle packed in a reusable mesh bag. Imprint Area: 3 1/2" x 3 1/2" per side. 9" diameter Plastic Frisbee, 90 g. weight, 1" High. Sporty one-size-fits-all visor with smooth edges all around and foam comfort strip. Great for the beach and outdoor events. 7 1/2" W x 9 1/2" L.
Imprint Area: 2" x 3 1/2"
PRODUCTION TIME: 7 days after art approval; Rush 4 day production is available: add $0.95 per kit. Blank kits ship next day.